Am I French? Am I American? Am I Mexican? These are questions that I have been asked by others and asked myself countless times. My parents are Mexican, my sister and I are first generation American and we both attended the Lycée Français de New York. My school was taught entirely in French – other than our daily English class- and allowed students to obtain both American and French High School diplomas. Our school consisted of 1,300 students from pre-k to 12th grade; 30% were French citizens, 30% were French dual citizens, 30% were at least half American and only around 10% had both parents who were from neither the U.S nor France. I was a part of that minority. Everyone wondered why two Mexican parents had decided to send their daughters to a French school, while having no French background or remote knowledge of the language. Why had my parents not simply sent me to an American school? My parents chose to send me to a school in which only a handful of my classmates knew what the word “integer” meant before SAT prep started Sophomore year. We had done of advanced math but it had all been held in French. None of my French standardized test scores mattered to American colleges, and most of my friends went back to Europe after graduation. I was obligated to take the TOEFL exam. Yet, my parents found these issues trivial compared to the benefits of my bilingual education experience. They valued diversity more than most of our skeptical American family friends did, and rightly so. People seemed to make different assumptions about my nationality based on the environment we were in: I was French-Mexican when with my American friends, Mexican-American in school, Mexican to the Americans and American to the Mexicans. Despite the confusion, I could communicate both verbally and culturally with a much wider variety of people than most of my friends could from a very young age. I learned to embrace diversity in a way that opened my eyes to a very different perspective on the world. But why does this matter today? Many of the anti-globalist problems present in our world today stem from nationalistic and racist views on immigration, inclusion and violence. This wave of nationalism has led to a resurgence of ignorance to the benefits of multiculturalism. Though these problems are in no way easily nor rapidly solvable, a productive step in the right direction is bilingual education. 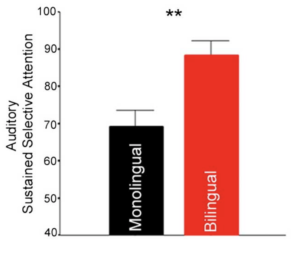 The graph represents the difference between a monolingual and bilingual individual to have sustained attention. 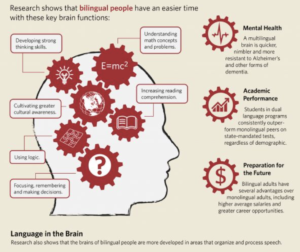 After researching all of the beneficial aspects of bilingualism, it has become increasingly clear that speaking multiple languages can have positive consequences for everyone, not simply those who speak the languages. Certain benefits identified include strengthened memory, delayed dementia, increased attention span, and academic excellence. However, these are no more important than the more social-based gains, which include cultural understanding, inclusivity and the ability to communicate with a larger group universally. Due to these social benefits that could occur, the Supreme Court should continue to uphold the rights of non-native English speakers. This should happen for various reasons. FIrst, for the sake of humanity; it must be reminded that regardless of their fluency in English, immigrants are still people and contribute extremely positively to the community. Second, the United States is a country built on immigrants from all continents and backgrounds who unified in order to create a country built on liberty and equality. Third, the United States should make it easier for the motivated, innovative people who chose to move to this country in order to make change. For these creations to take place on US soil is good for the country. Furthermore, congress should pass a policy to quell these nationalist sentiment by encouraging bilingual education. Education is supposed to enrich an individual both intellectually and socially. Becoming a more well-rounded individual and being more culturally aware are things that will benefit a student far beyond his/her school days. These are things that can create an even smaller world and can allow the violence to lessen. Having gone to a foreign, bilingual school has presented me with the largest diversity of friends, languages and cultures than I could’ve ever imagined. This has created an inclusive nature within me that was developed from the time I was 3 and has kept developing every day since. More kids could develop the same strength. (10) Academic Press New York San Francisco London. “the Bilingual Child: Research and Analysis of Existing Educational Themes.” (1976)Print. (11) Afendras. Le Bilinguisme Chez l’enfant.Print. (12) Carey, S. T. Bilingualism, Biculturalism & Education.Print. (13) Cohen, Andrew D. A Sociolinguistic Approach to Bilingual Education: Experiments in the American Southwest.Print. (14) Department of Government Funded Programs and Board of Education of the City of Chicago. “Bilingual- Bicultural Education.” Print. (15) Educational Testing Service. “Bilingual Education.” Print. (16) Georgetown University Press, Washington DC. “Current Issues in Bilingual Education.” Print. (17) Lewis. Bilingualism and Bilingual Education.Print. (18) McLaughlin, Barry. “Second-LAnguage Acquisition in Childhood.” Print. (19) Mokhtar Farhadian, Rohani Abdullah, Mariani Mansor, Ma’arof Redzuan, Neda Gazanizadand and Vijay Kumar. Theory of Mind in Bilingual and Monolingual Preschool Children.Print. (20) Padilla, Raymond V. “Ethnoperspectives in Bilingual Education Research: Theory in Bilingual Education.” Print. (21) Washburn, David E. “Ethnic Studies Bilingual/bicultural Education and Multicultural Teacher Education in the United States.” Print.